the brilliant light of his or her heart always remains." I want to take this opportunity to begin this module by telling you one of my personal stories of how I asked my Angels to guide me through a difficult time. It was back in July 2013, I had one of those days that turned into one of those weeks. Everything felt out of alignment and boy did I know it and feel it. It was during the final process of moving from one house to the other that I allowed the never-ending tasks associated with moving and my mounting work load to knock me off center and take me away from my joy. My joy was replaced with the feeling of being completely overwhelmed. I have found on my journey thus far, any time a major move occurs it creates the environment to release many things we may have been holding onto for years or our entire lifetime that don't serve us and are ready to be dismissed. So not only is it a great time to shed physical things like extra clothing or furniture, but emotional baggage too! This was true for me and my family. During this move old patterns, things that didn’t serve our family and life changing events were being brought to the surface and converging. When this occurs, if we remain conscious and centered in our hearts, this allows us to know everything is just fine, we are just shedding old baggage and experiencing emotions that have been stirred up by the act of moving around lots of energy. If we do not remain conscious and centered in the heart we travel away from the heart and thus we can allow ourselves to spiral downward into negativity, drama, or fear. Our body gives us the gift of warning signals (negative emotions and feelings of discomfort: anxiety, anger etc. ), the moment we begin to travel away from our heart. When we stay conscious we do not plow past the first alarm bell. Instead we take note and start asking questions of the heart to determine why we are feeling this way. This was not the case for me in this story and I allowed my self to plow past alarm bell after alarm bell until I had a five-alarm fire on my hands. Our Sacred Heart is the Divine Vessel where peace and joy reside and I could feel both of them slipping away as I began to travel away from my heart by allowing stress and negativity to get the best of me. So a few days later, after making a major impact on getting the house put together I decided it was time for me to get "myself" back together. I got in my car. “I asked my Angels, which direction should I go?” I heard in my head, “south.” As I sat in my garage I then scanned the map on my iPhone. My eyes immediately landed on the town of St. Peter about 60 miles south of Minneapolis. I pulled out of the garage, turned off the radio and drove in silence. With each mile of highway behind me I could feel my energy, joy, and peace returning to me. The reason? I had made the conscious choice to take the steps necessary to return to my heart. The moment I arrived in St. Peter I felt guided to drive up a quiet street which led me to a cemetery on a hill. It was a beautiful sunny day. I grabbed my sunglasses, got out of my car, and walked through the cemetery. 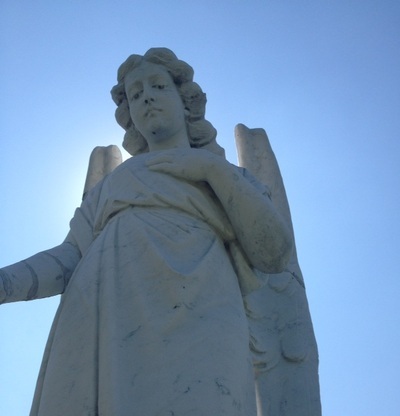 Each time I walk through a cemetery I ask my Angels to send down sparkling love and light from the heavens to send unconditional love to honor those souls represented there. With each footstep I began to feel a little lighter and brighter. I could feel the light I had dimmed within me by traveling away from my heart now begin to burn brighter and brighter. 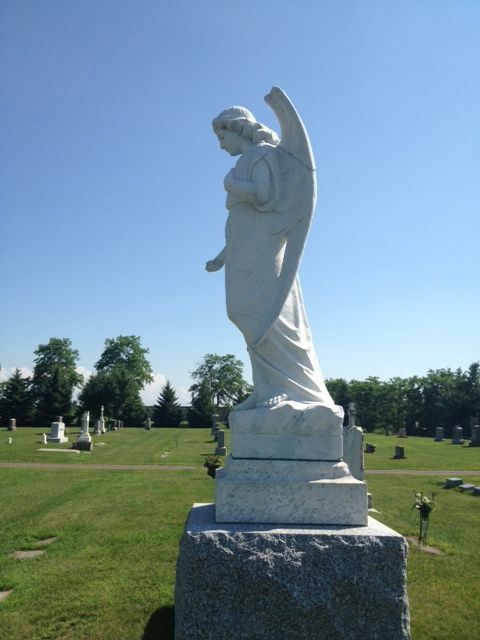 In the distance I saw the most beautiful Angel statue standing watch over the grave of a beloved. I felt the warmth wash over me as I made my way to the Angel. As I sat beneath this enormous Angel I snapped a picture of her looking down at me. At that moment, I felt myself lock back into my heart. “I’m back.” I said. And as I looked on the ground before me I saw a mini-miracle that I had not seen until I returned to my heart. 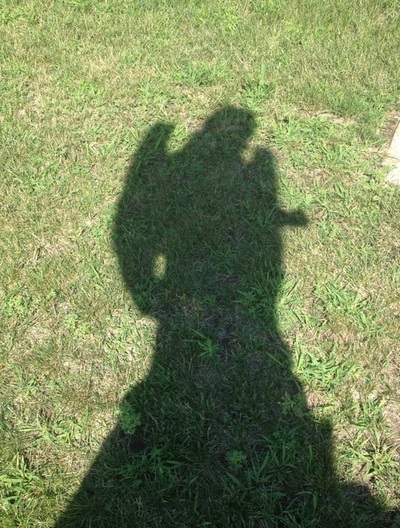 My Angels had lined up my inspiration behind the scenes and guided me to that exact location at that exact time of the day for the sun to travel behind the Angel in order to appear on the ground as a shadow before me. This mini-miracle that just occurred was a wonderful reminder which allowed me to remember. I must be in my heart in order to see all the miracles before me. I said, "Thank you" for the entire journey that brought me to that cemetery that day, even though it originated in lots and lots of pain. A mini-miracle is a gift from the Angels to inspire you and let you know this truth...You are never left to wander alone and deeply loved by the heavens. Please remember, you can ask your Angels at any time to fill you up with light from the heavens to help you maintain your JOY during difficult times. The reason my Angels wanted me to add the information about living in the truth and transparent living to this module is because in order to experience, hear, see, and feel all the miracles the Universe has to offer us we must make the committment to live in the truth. When we walk in the truth we move deeper into the heart. When we move deeper into the heart we begin to raise our vibration. When we raise our vibration and live on the vibration of truth we gain pure sight and when we gain pure sight we begin to see multi-dimensionally. Approximately two years after I initiated my walk of truth, my eyesight began to change. I began to see the magical things that occur when we live on the vibration of truth. These include: Angel sparkles and Divine Thought sparkles. One of the ways you will know that you are living on the truth vibration is because you will begin to see Angel sparkles out of the corner of your eye. A sparkle occurs when an Angel enters the room. For me, the sparkle appears out of the lower left corner of my eye. It looks like a very quick brilliant flash, sparkle or tiny piece of floating glitter. This occurs quite frequently when I am creating course modules or writing something that I will release to share with the world. The Angels arrive to guide me because I welcome the wisdom they flow to me and it is my heart's intention to ensure all the material I create has honor, purity and truth at its foundation. A Divine Thought sparkle occurs when an Angel or Fairy throws you a thought containing wisdom. To me it looks like really tiny twinkling white lights that appear in front of my vision for a millisecond then, they are gone. Seconds later a thought will arrive in my mind of something profound that I am suppose to write about and share with the world. In fact, the information about Angel sparkles and Divine Thought sparkles was included after viewing a series of thought sparkles and then receiving the inspiration about including this information in the module! The best way I can explain what a thought sparkle looks like is if you have ever almost passed out -- it looks like those flits of light that pass before your vision just before you lose consciousness. Another visual explanation I can give you is when you see twinkling fireflies in the air on a dark summer night. However, a Divine Thought sparkle is much, much smaller than a firefly light and it appears right in front of your eyes and goes away very quickly. I see Divine Thought sparkles best when I am writing early in the morning and it is still dark outside. It's difficult to see them in complete daylight. Souls that have made the committment to fulfill their promise by living a life of integrity, honor, and walk in the truth experience this magical gift. Souls that are writing "new world" books of light experience this gift as well. Continuously accessing the wisdom of your heart, drawing on the strength of your inner light, maintaining the connection with the Divine and remaining in your core integrity will ensure that you will begin to experience this gift too! A note on truth and purity: When people say to me, "It's too hard to live in the truth." "There is no fun to be experienced living in the truth." "There is no way to obtain a life of purity." I simply state with love, "When we make the choice to live in the truth those negative illusions such as drama, betrayal, deception, doubt, and fear all are brought out into the light. If you were able to see the things I see I feel you may think differently. My hope is that some day we will be able to experience the wonders I see together." For those with eyes, let them see. For those with ears, let them hear. let them access the wisdom of the ages. Here's a story that will give you another look at how amazing life can be when you involve the Angels in helping you spread love and light in the world. It was back in December 2013, I walked into the YMCA for my yoga class. I noticed there was an adorable tree filled with stars and lights set up in the lobby. Attached to each star was a number that pertained to a child and the gift they desired for Christmas. I loved this kind gift giving idea so as I stood before the tree I asked my heart and my Angels the simple question, "Which tag should I choose?" I love taking the time to ask my heart and my Angels for assistance regarding the simplest of decisions because this conscious act always produces magical results. I found the tag that felt right in my heart -- a tag for a 10-year-old girl wanting a bean bag chair for Christmas. I returned to the front desk, tag in hand, so the staff member could record my name and tag for the secret Santa gift program. The Angels began whispering in my ear as I stood before the counter. I heard, “Easy-Bake Oven, Easy-Bake Oven.” I make a point to take mental note by paying attention to random messages. I have found they always have significant meaning soon after. I began speaking to the two ladies behind the front desk. As I handed them my tag representing the gift I would purchase on behalf of the 10-year old child I mentioned, “Did you ladies ever get an Easy-Bake Oven for Christmas?” One young woman named Natalie said, “I wanted one for Christmas when I was a child. One Christmas it was the only thing I wanted and I didn’t get one. I cried and cried.” I finished our conversation and headed out the door for the nearest Target store to purchase the bean bag chair. While at Target I found the perfect “violet” bean bag chair for the 10-year old girl. My Angels continued to pop into my head the words “Easy-Bake Oven.” I was then guided to the aisle where the Easy-Bake Ovens were displayed. I thought for a moment, “This doesn’t make sense she’s a grown woman. Why would I be feeling compelled to purchase an Easy-Bake Oven as a gift for the woman behind the counter at the YMCA?” By asking my heart that question my Angels flowed forward the answer. “Because it was a childhood dream for a soul that has not yet come to pass.” I felt those words lock into my heart with certainty. “That makes total sense,” I thought. "I could be an Earthly Angel and fulfill that dream of the heart." I followed my heart and proceeded to the nearest check-out lane with the bean bag chair and the Easy-Bake Oven. Thirty minutes later I walked into the YMCA once again. In one arm I had a violet bean bag chair. In the other arm I had an Easy-Bake Oven. I approached the counter and said to Natalie, “Here is the bean bag chair for the little girl and this oven is for you.” I continued, “If for any reason you don’t want it all I ask is that you pay-it forward to someone that will enjoy it.” Natalie said, “Oh my gosh, thank you!” I gave her my card and a hug and headed back home with an expanded heart. Moral of the story about Angels and the Easy-Bake Oven…Kindness always leaves a timeless deposit on the heart and our Angels will always guide us to a soul that we can bless in some big or small way and leave a trail of positivity and light. All we have to do is open our heart to hear, see, or feel the signs of communication they are joyfully giving us. Angelic note: The Angels would like to remind you to continually ask your heart and your Angels for assistance, even for the simplest of requests, just like I explained in the story above. The answers your heart will reveal will always be truthful and the encounters with souls that will be flowed before you as your Angels work behind the scenes will always be magical and inspirational! We have armies of Angels waiting in the wings to assist us, inspire us, and guide us. It's true we have the ability to call upon hundreds upon hundreds of Angels for assistance. How truly fantastic is that! I ask my Angels to travel with me and surround me wherever I go. I have conversations with the Angels from my heart throughout the day. I say things such as, "You Angels are so awesome!" "Thank you for helping me." "You are all so funny!" Here are some examples of how I ask for Angel assistance: I ask them to surround the airplane I just boarded in a circle of white light protection. I ask them to send light and love throughout the airplane cabin to calm any souls who may be nervous about flying. I ask them to surround my car in a circle of white light protection as I drive throughout the city. I ask them to send light, love, and healing to any souls I may see involved in a car accident on the roadway. I also ask my Angels to send in another souls Angels to wrap their wings around the soul in distress or in need of assistance that is connected to an ambulance or a police car that passes by me on the road with flashing lights. I had been dozing on the plane on a recent trip back from Florida to Minnesota when my Angels woke me up to have me look out the window. 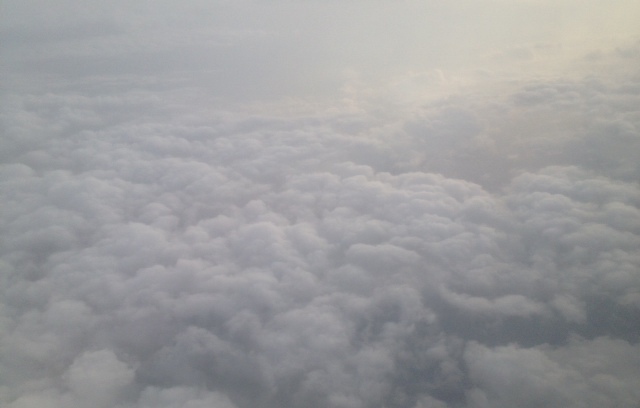 Don't these clouds look like heaven clouds? So beautiful! My friend Jill says, "When I go to heaven I want to be a cloud maker!" What an inspirational job that would be! Special assistance note: If you ever find yourself in need of assistance in a time of emergency, send out a beacon of light from your heart such as, "Angels, Angels, Angels please be with me. I need your immediate assistance and guidance. Thank you!" And they will come zooming in from across the dimensions to be by your side. When you send out a beacon from your heart it looks like a searchlight sending a stream of light from you, to the heavens. I love, love, love my Angels and I ask them to be by my side always. Whenever I travel I receive such incredible mini-miracles to reassure me that they are with me. Here's one recent example. At our hotel on a trip in Windsor, CA we were assigned to a hotel room down a hallway with just two rooms - 111 and 112. The next day we stayed in Napa, CA. We were assigned to this section of the hotel with just two rooms side by side 2111 and 2112! Ask your Angels to create a circle of protection around the car, train, or plane when you drive, fly or travel. Ask your Angels to circle you in white light when you enter a room if other people are present. Then, follow it up with sending a beacon of light from your heart. This allows you to stay within your own energy space, keep others out of your energy space, and sends the light of love from your heart to to lighten and brighten the room! "I loved the Angel number module and really connected! Thank you so much for all the helpful information and insight. Today, I have seen - 222, 333, 555, 666, 888 - so far! Becky went on to say, "I did what you suggested about asking your Angels for a specific sign. I asked my Angels, if Charlie, a dog that is up for adoption and needs a new home, is to be part of our family to please show me a Blue Jay." I had just started course module two. I left the module up on my computer to go outside; when I returned I continued with the course and came upon the section titled Pennies, Dimes, and Feathers. I couldn't believe it when I saw the Blue Jay feather in a jar in the picture in that section of the module. How beautiful is this, Molly!" When we believe and have absolute faith in our Angels this is how quickly they can work behind the scenes to flow us our answers of inspiration and provide mini-miracles. When we believe this also means, we take off our blinders and make the choice to "see." Pure sight is vital in order to see the endless signs and clues placed before us. Our Angels work in teams to relay and deliver messages to others. Here's what happened behind the scenes regarding Becky's Blue Jay feather story. While I was in the process of creating Angel module two I had been trying to locate a picture of my feather/penny bowl to document the wonderful Angel feathers I had found this past year. My intention for that section was to show you all a photo to inspire you to start your own Angel collection bowl/jar. I looked and looked and looked and couldn't find the picture on my computer that I had in mind to show all of you. We had also moved recently and I couldn't locate my original Angel feather bowl that had been packed away. So, instead of getting upset I surrendered and decided to take a picture of my new Angel collection jar. The picture I took contained a glass jar of feathers, pennies, and dimes (refer to module two for the picture) including a beautiful Blue Jay feather. The same day I received the email from Becky telling me about the significance of the Blue Jay feather popping up in the course module right when she needed it to, was the same day my Angels flowed me to the location on my computer that contained the picture of the original bowl of Angel feathers! Here is what is so remarkable when you look for the reason behind all life events. My Angels told me the reason I couldn't find my original bowl of feathers or the picture is because they wanted Becky to be able to discover the Blue Jay feather picture in course module two, first. The Angels - Becky's Angels and my Angels had formed an Angelic team behind the scenes. This "teamwork" not only blessed Becky with an answer she needed on that day, but it also blessed me with another story of synchronicity to share with all of you. This process is called Divine Timing and Divine Reason. When we surrender to the heart we find everything has reason and purpose. This also creates a chain of goodness for when you follow the clues or guidance placed before you, you will always have an opportunity to bless another soul. The Angels knew her success story involving Angel communcication would bless and inspire many others to communicate with their Angels too! This is one of the reasons its important to remember to surrender and go with the flow. The moment I could feel myself getting upset over not finding my original picture I "let it go." If anything starts to feel difficult it is important to start making mini-course corrections to stay in the correct alignment of positivity so things can flow to you. And that just might be to "let it go" which releasing any energy that might be blocking you from attaining your goals and dreams. So, I did just that and came up with another plan, a new picture. That new picture is the basis of inspiration for this entire story. If I didn't surrender. This story wouldn't exist. When we surrender we allow the heart to lead the way. Allowing our heart to lead the way allows us to create incredible stories of lasting goodness. Back in August 2013, I awoke at 2 a.m. with a specific message for a lovely woman named Debra who had connected with me through Facebook after finding one of my Violet Wisdom Radio shows online. Debra is an Earthly Angel and a Guardian of Light. This type of restlessness has hit me plenty of times before. In fact, during the process of writing my first book, The Book of Simple Human Truths, the Angels consistently woke me up each morning, many times at exactly 3:33 a.m. I began calling this Angel time, because each time I woke up at 3:33 I would receive a very important message flowed into my heart that the Angels wished me to include in the book. On this particular day, the Angels woke me up early by whispering in my ear. They wanted me to deliver a message of light and inspiration to Debra. The Angels were hoping that a message from me on their behalf would be the final nudge to get her moving forward with bringing one of her gifts of goodness to the world. Debra has a very special gift. She assists souls who have lost their way and are stuck between the dimensions of Heaven and earth. These individuals have missed the opportunity to rejoin the light at the time of their transition. Many people refer to these individuals as ghosts or spirits, but to me, they are simply souls that have not yet connected with God’s light once they have left their physical bodies. These souls remain in a state of limbo until they are guided to become ONE with the light. The message the Angels delivered for Debra was simple. They told me, “Please tell her to start blogging about her experiences helping souls to cross over to the light.” The Angels wanted Debra to know that by doing this, she would accomplish many wonderful things. By telling the story of how she connects with and assists souls on the other side, she would be able to bring the topic of ghosts and spirits out into the light of truth and assist with dispelling the illusion of fear that has surrounded this topic for centuries. The Angels had one final, inspirational message for Debra that morning. They wanted her to know that these souls are looking for compassion, love, assistance, and direction, and are attracted to her light because they can "feel" her pure intentions and the love she emits from her heart. The Angels said, “Please tell Debra these souls know they will be safe in her care. They trust her.” The Angels continued, “We want to thank her for all her contributions of the heart on behalf of humanity." What a beautiful angelic message of light! You wake up in the middle of the night with a specific message, thought, or idea for yourself, another soul, or humanity. Keep a notebook by your bed. If you awaken in the middle of the night, start asking your heart questions. What thoughts were in my mind when I awoke? Was I dreaming? What was the dream about? Were any of my friends or loved ones in the dream? Do my Angels have a special message for me? Am I supposed to get up and start writing something? There is always a reason for awakening. The more you communicate with the Angels at this time, the more revelations and answers you will find. Whenever I encounter a soul that I feel is in distress, needs assistance, or is feeling hopeless or unloved; and whether its a person I just met, a friend, or a family member -- I send that soul love and light from my heart. I then ask the Angels to infuse that soul with love and flow more souls in front of them to "light them up with inspiration." Remember, if you ask for things of goodness it shall be so. Because we are all energy you can do this with anyone, even world leaders! This is why we can connect with the heart of another in any part of the world or even in other dimensions! How wonderful our world would it be if our world leaders began feeling love sent to their hearts on a daily basis or felt the loving presence of their Angels? The more people that make the switch to the positive and send unconditional love to all souls we will begin to see impactful and positive changes on all four corners of the earth. I have yet to find a meditation that has had a more powerful impact in my workshops and Angel sessions than this one. This simple meditation can help a soul realize in five minutes or less how truly brilliant he or she is -- no matter what illusion of negativity that soul may be currently believing about him or herself. Become centered in your heart space by focusing on the bright light within your heart center. Ask the Angels to join you and assist you with this meditation. Imagine in your mind’s eye that you are standing atop at the highest peak of any mountaintop in the world. Feel the presence of your guardian Angel on your right side. You may also see a small grouping of Angels or even an army of Angels beside you! Feel the presence of God’s magnificent light on your left side. Feel the support of the Universe. You are adored and safe. Ask the Angels to flow into your being what your Angel wings look like. Feel your wings and how they rest upon your back like gentle feathers of light. Spread them out and lift them up off your shoulders. Are they light or heavy? Are they expansive, medium-sized, or petite? What color are your wings? Are they adorned with anything such as sparkles, sequins, or gemstones? Imagine the shape of your feathers – are they like that of an eagle, swan, or dove? Allow the information to flow into your being until you feel complete. Now, turn and ask God how you earned your wings and wait for the answer to arrive in your heart. Next, look with an eagle’s-eye perspective and see a cottage in the distance at the bottom of the valley at the foot of your mountain. Get ready. You are going to take flight. You may fly solo or ask God and the Angels to fly with you for support. When you are ready, flap your majestic Angel wings and lift off towards the cottage. In a few moments imagine yourself landing safely and standing before a beautiful wooden door. Reach out and see your hand grasp the doorknob. Tuck your Angel wings back upon your shoulders and enter the cottage. Upon entering, see yourself as you are now in physical form here on earth: shining the light of your heart more brilliant than ever before. You have arrived. Your spark in Heaven has connected with your spark on earth. You have stepped into your divinity. Congratulations! You have stepped into your divinity! Transition your thinking away from hoping and wishing toward KNOWING with absolute certainty that the Angels are communicating with you. Remain connected to the heart to attain a clear connection for receiving Angel communication signs. Realize that many times Angel communication can be subtle. You must remain conscious and aware to recognize and to see the signs. Surrender to the heart and keep it open wide to allow in wisdom from the Divine. Recognize that negative emotions such as worry, dread, anger, or fear move us away from the heart, create resistance, dim our inner light, and can prevent Angel communication signs from being received. Let go of any limiting beliefs and welcome into your life infinite miracles! Know in your heart that you are surrounded by love. Have faith that the Angels and our loved ones who have transitioned are guiding us behind the scenes, always. Ask the Angels to keep your lessons simple. Ask the Angels to bombard you with obvious messages. Design how you want the Angels to communicate with you. The higher your vibration, the easier it is to communicate with the Angels. Remember that positive vibrations attract all things positive. Find a buddy or form a group and unite hearts to discuss the simple Angel communication methods and Earthly Angel principles contained within this book and then share your Angel experiences and photos each time you meet! Resistance of any kind creates barriers and closes doors. Saying, “yes” to all things of goodness opens sacred doors in the stars and honors our journey. Sometimes all we have to do is make the simple choice to stop being angry or fearful in order to discover the infinite wonders of the Universe that await us behind a door we shut long ago. Keep your heart open wide. Find the sacredness in every moment. Breathe love and light into each experience. Show gratitude for all life experiences flowed before you. Create Heaven on earth by making the choice to walk in the light. Honor yourself, all souls, Earth, and God’s creatures, because this allows you to connect with your soul’s essence -- LOVE. Long after an Earthly Angel leaves this earth, the brilliant light of his or her heart always remains. I wrote this course and the book Becoming an Earthly Angel because I feel in the depths of my soul that the world needs more Earthly Angels and Guardians of Light. My sincere hope is that you will choose to become one and arrive at the inner knowing that God’s light resides within each one of us. Name three things you have noticed that are positively different in your life since initiating your intentional walk of truth, love, and light with the Angels. Name three obstacles you have encountered since you initiated your intentional walk of truth, love, and light. Did you remember to call in your Angels for assistance? What tips or tools did you use to stay within your core integrity and your heart to keep you steadfast on your soul expanding goals? Earthly Angels, Finding Heart-shaped Everything & Becoming a Beacon of Light! ​Molly Friedenfeld’s book Becoming an Earthly Angel will teach you how to connect with the Angels, your soul brothers and sisters, and loved ones who have transitioned to the light. 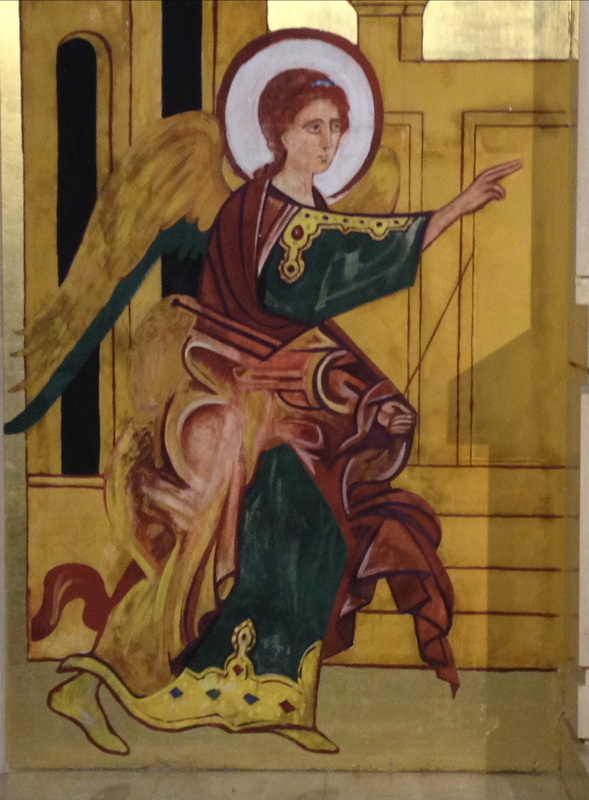 Friedenfeld also shows the reader how each soul can make the choice to step into its divinity, become an Earthly Angel, and connect with the Angelic Realm. Focus on love. Shine the light. Change the world. 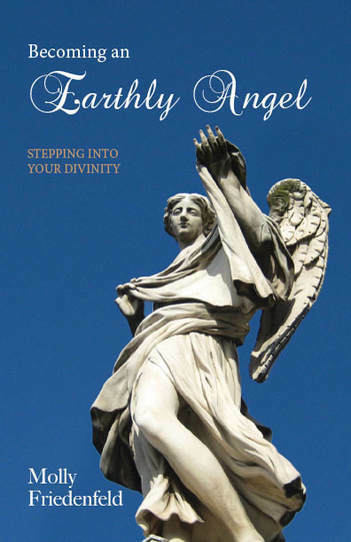 Your sacred journey with the Angelic Realm begins here. Support this Project of Light and receive Becoming an Earthly Angel book free with a $20 donation.